Water has been a constant in our work across India; whether it is cleaning water bodies, digging wells or making irrigation canals. This elixir of life has been and is an urgent but unaddressed basic need of the masses we work with. In the last couple of decades, although Jammu & Kashmir (J&K) has tragically become a synonymous of strife and conflict for the rest of the world, the beauty of the valley remains unmatched. The story of this heaven on earth is certainly incomplete without the mention of the Dal lake in the heart of Srinagar. As the world faces a bigger danger of pollution every passing day, this is a heartwarming story for the hope it brings. The Dal is the soul of Kashmir, known worldwide for its serene beauty. What’s not so well known is that the lake has progressively been getting choked with the increasing web of weeds – azolla, algae, lily pads and other wild weeds. This naturally is a matter of grave concern especially for the people for whom the lake is home. As per India Water Portal, Srinagar’s Dal lake shrunk by 36% in the last 37 years. According to an eminent scientist, Dr. Abdul Majid Kak, studying the Dal lake, “The thick mats of Azolla block the sunlight to the lake’s flora and fauna and ultimately cause their decay. 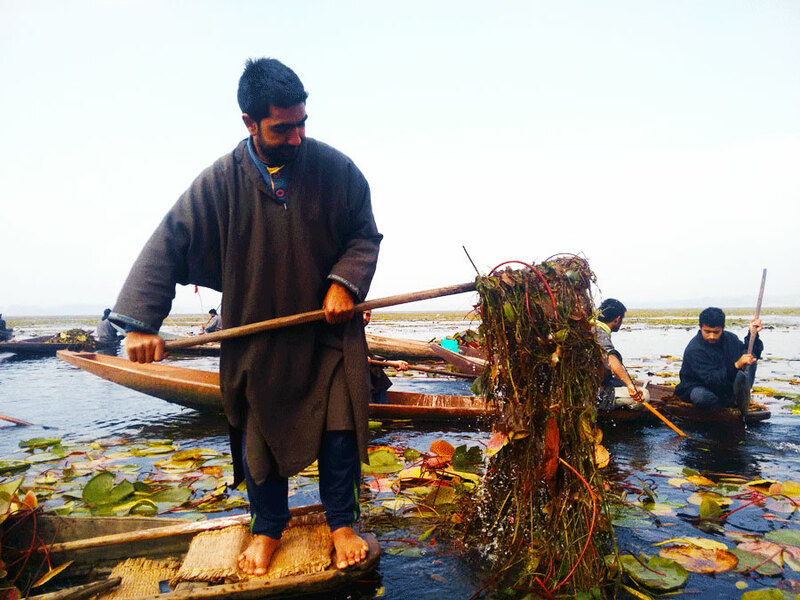 Azolla is hampering Dal’s water circulation, which is a must, for it carries away the lake’s nutrients and prevents growth of harmful water ferns.” When the 2014 floods devastated Srinagar and submerged Dal as well, Goonj worked closely with the people of Moti Mohalla, Asthawol area in Dal lake. When the idea of ‘Cloth for Work’ (CFW) was introduced to them, their response on what they would like to work on, was unanimous – Let’s clean the Dal, let it breathe!! In the first round of the cleaning work 145 people participated with 70 boats, to extract the weeds. Facing dense fog and the winter chill they worked tirelessly for two days. “The Government spends crores of rupees in cleaning this lake using machines every year, but all in vain. Goonj took up a participatory approach involving us-locals. We have been doing it for centuries, we know how to clean the Dal,” said Wahid Hussain, a local participant. One month later, in the second phase, 167 participants cleaned a part of the Dal using 78 boats again for two days. In total more than 500 boat loads of weed and other waste was extracted and over 100,000 sq. metres area of the Dal was cleaned in the process. Cleaner water also means fewer water-borne diseases for the inhabitants of this lake. It also translates into enhanced mobility and tremendous ecological benefits. True to the dictum that in nature nothing is a waste, some of the extracted weeds became fodder for the cattle and the rest was decayed and used as manure. Well the story does not end here.. more recently, in December 2017, we came across a news story in yourstory.com with the title ‘1,300 Shikarawallas, one mission, cleaning up the jewel of Kashmir’.. indicating that the authorities have realised the failure of machines to clean the lake. In September 2017, LAWDA had reverted back to the traditional way of cleaning the Dal by hiring around 1,300 boatmen cleaning more than 10 lakh (1 Million) cubic meters of weeds.